All transactions are safe and secure with a reliable history in online purchasing behind each of our associates. Buy the Ministry of Silly Walks t-shirt to own Monty Python clothing and merchandise. 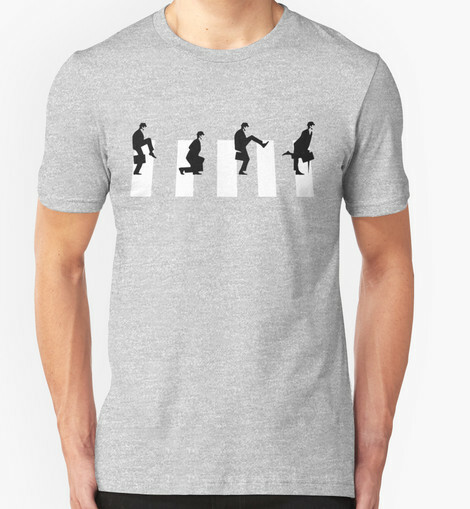 The Ministry of Silly Walks t-shirt celebrates the well known John Cleese sketch that was featured on Monty Python's Flying Circus BBC comedy show. John Cleese portrays a government official in charge of allocating funding for the development of new silly walks. Do you have a silly walk worth patenting? Show it off in this red Monty Python t-shirt that is great for any fan of the Flying Circus. Practice your silly walk in your Killer Rabbit slippers or Holy Grail Monty Python costume (tunic) and helmet. In addition to the Ministry of Silly Walks tee above, browse the Monty Python Clothing Gallery for more apparel like men's and women's clothes, kids shirts or hoodies.